Our favorite one stop shop for your bagel and schmear spread. Did you buy your brisket from Trader Joe’s for Rosh Hashanah? Maybe your apples and honey, too? Well, the Jewish New Year isn’t the only holiday that TJ’s can cover — the always-anticipated Yom Kippur break-fast where dairy and carbs thrive is a particular strength for our favorite discount supermarket. Here’s how to cater your entire break-fast from Trader Joe’s. First thing’s first: If you have been abstaining from coffee for the last 25 hours, then coffee is TOP PRIORITY. I have always loved TJ’s variety of ground and whole bean coffees. But when getting that caffeine into your blood stream is of the utmost importance, try their cold brew cans doused with half and half and sugar. You’ll feel like yourself again. Fast. 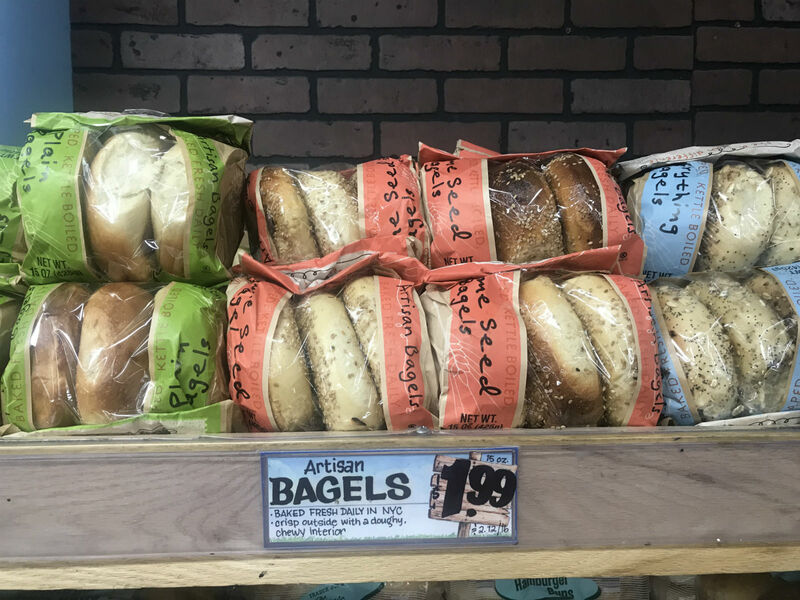 Well, obviously you need bagels, and they’ve got all the classic flavors you could want: plain, everything, cinnamon raisin, and sesame. They also carry gluten-free bagels. From plain to whipped to seasonal flavors like pumpkin spice, don’t forget the schmear. TJ’s carries several varieties of traditional lox and they also carry smoked trout! It’s a fact that you can never have too much smoked fish when serving bagels and cream cheese. Yom Kippur break-fast is the perfect occasion to bring out the big laminated pastry guns for your spread. Have you tried Trader Joe’s frozen croissants? They are heavenly and incredibly easy to prepare with just a bit of planning — leave them on a baking sheet overnight, bake in the morning, and voila! You can find the chocolate, plain, and almond croissants in the frozen section. They also carry cinnamon rolls in the refrigerated section for something a little quicker. Making the oh-so-traditional and delicious blintz souffle for your break-fast? 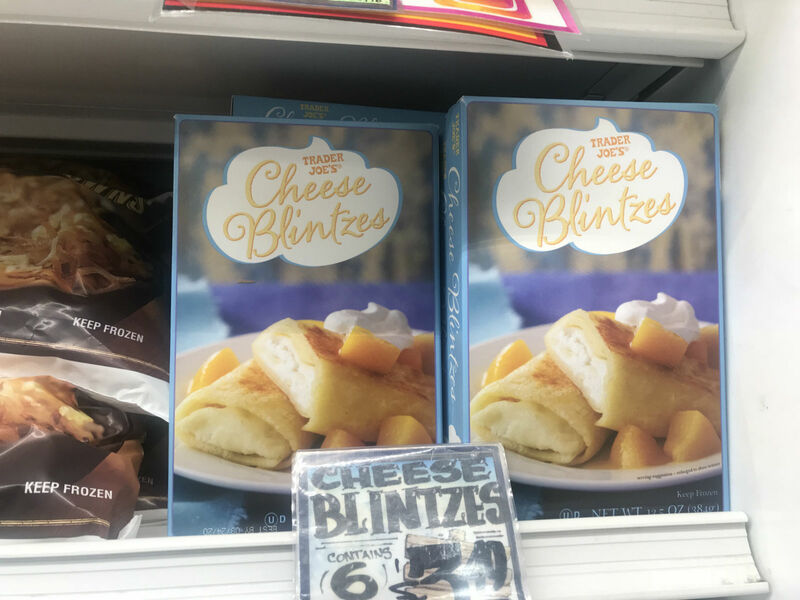 Trader Joe’s even has their own brand of frozen cheese blintzes. You’re welcome. You may not know this, but TJ’s actually carries some high quality medjool dates, which are the perfect sweet bite to wake you up and restore your blood sugar after a fast. We all know that TJ’s Brooklyn Chocolate Babka is pretty divine. They’ve also got rugelach, apple slab pie, and those fabulous seasonal pumpkin kringles that will disappear in about two seconds. They’ve got orange juice! Pineapple juice! Sparkling pink lemonade! But my personal favorite is to combine their fresh squeezed orange juice with fresh carrot juice a la the Israelis. So refreshing and you feel kinda healthy, too. 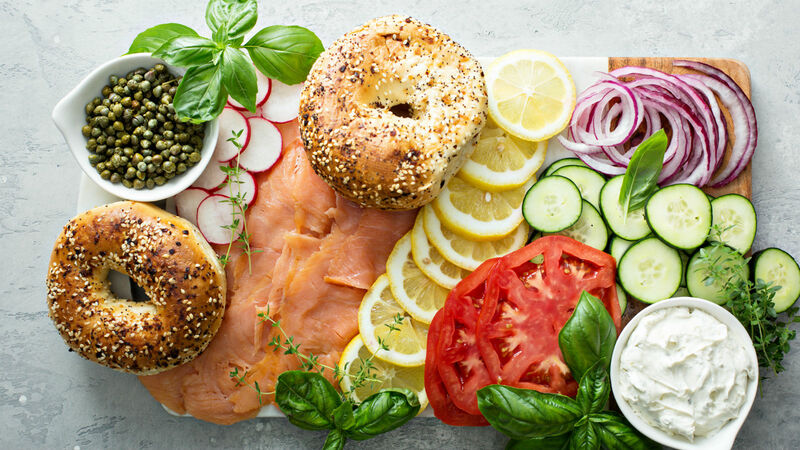 You need tomatoes, cucumber, and red onion to go with that bagel and lox, not to mention some fresh fruit to round out all those carbs you just ate.